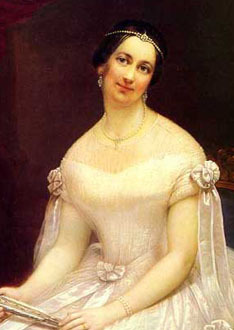 Julia Gardiner Tyler was the second wife of US President John Tyler. She came from a prominent, wealthy family, the namesake of Gardiners Island in New York, where she was born. Owned by her family since 1639, it is the largest private island in the United States, and the last piece of American real estate which remains intact from its royal grant by the English Crown. As a young woman she was described as being "flirtatious, prone to be indiscreet, and very daring", and after her social debut at age 15 she had numerous gentleman callers, reportedly including naval officers, a Supreme Court Justice, and at least two members of European royalty. At 19, to her parents' dismay, she accepted payment to have her vivacious image used in an advertisement for a dry goods store. Her father, a New York state Senator, was killed in 1844, when he happened to be standing near a cannon that misfired aboard the USS Princeton. The newly-christened Navy ship was taking President Tyler and numerous dignitaries on a ceremonial cruise down the Potomac River. Julia was aboard the ship when the disaster happened, and when she was told of her father's death she reportedly collapsed in grief, into President Tyler's arms. They were married four months later, and after their wedding she was First Lady for less than a year. During her brief time in the White House, she resumed the tradition of hosting grand Presidential balls, something Tyler's bedridden previous wife, Letitia Tyler, had shown little inclination toward. Fascinated by the trappings of near-royalty, she instituted the White House tradition of having a band strike up "Hail to the Chief" whenever the President entered the room at social events, usually with her on his arm. She was the first First Lady to hire a press agent, charged with making sure she received favorable coverage in the newspapers. She was thirty years younger than her husband, and five years younger than his eldest daughter, which led to icy relations with her stepchildren. The second Mrs Tyler had seven children with her husband, which, in addition to the eight children from his first marriage, made him the most reproductive of all American Presidents. After his Presidency, they retired to his plantation, called Sherwood Forest. She later authored an article in the Southern Literary Messenger, defending slavery as "a civilizing influence".